There is a lot of untapped potential in the world and amazing projects that are spinning around heads uncompleted. One of the causes of this buildup of unused inspiration is lack of funding and knowing where to look for it. When it comes to expressing ideas and realizing passions, one can feel unsupported and not have a clue where to start their search for that support. 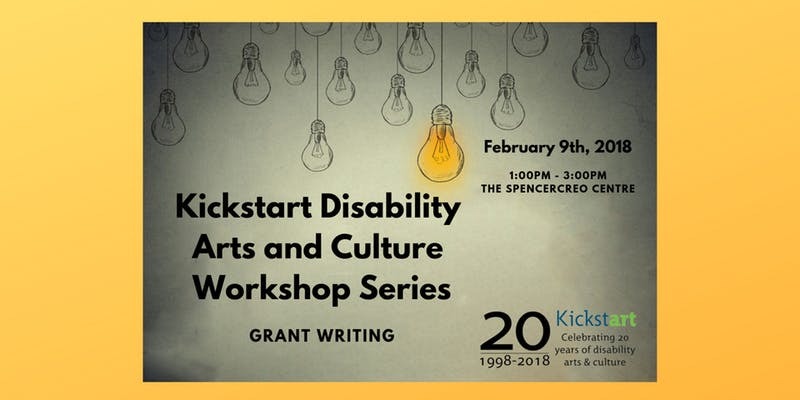 Kickstart wants to help acknowledge the needs and interests of emerging disabled artists by offering a workshop on grant writing. Mary Ann will share their knowledge of grant writing and also where to search for grants in a way that is simple and not overwhelming. Here to help with the pressing issues of beginning ones’ search and working on tone and structure in writing, Kickstart wants to make goals of artists with disabilities tangible. This two-hour workshop on Feb 9th will assure one of their own skills and inspire comfort in asking for they want and why. Free for Kickstart Members and The Gathering Place Members. $10 for the general public. Attendants are FREE, but require a ticket. ASL Interpretation will be available. The SpencerCreo Centre is a wheelchair accessible space.